Set in the heart of the picturesque village of Holmfirth, near Huddersfield, West Yorkshire, and within easy reach of Leeds, Bradford, Wakefield, Barnsley and Sheffield, Bijou Bridal Boutique offers you, the modern day bride an exclusive collection of British designer wedding dresses, bridesmaid dresses and bridal accessories from Award winning designers including Alan Hannah, Ivory & Co. Bridal Couture, Lyn Ashworth, Motee Maids and Lily Rose Bridal by Romantica. We pride ourselves on offering a first class one to one service based on old fashioned core values and the very best customer care, in a modern sophisticated boutique. Our gowns are made from luxurious fabrics and embellishments from four of the industry’s leading British bridal dress designers, with prices ranging from £1,000 to £3,000. We have something for every bride. To book your exclusive appointment to find your dream dress, please visit the Contact page. We boast an exclusive Bridal Lounge for your bridal appointment, for you and your guests to relax and enjoy, with professional and friendly customer service at the forefront. We understand that it is an incredibly exciting and often daunting journey to find the most important item of clothing you will ever wear and we pride ourselves on providing a very special welcome as soon as you enter our bridal boutique located in West Yorkshire. From the moment you choose 'The One' right through until you collect it for your big day, you are our number one priority in making your Wedding day as special as it can possibly be. Please take a moment to read through our Testimonials from real brides. We look forward to welcoming you. We offer an exquisite range of British made bridal accessories including wedding shoes by Harriet Wilde, Diane Hassall and Rainbow Club, bridal veils and hair accessories by Richard Designs and Joyce Jackson, ceremonial tiaras and headdresses by Richard Designs and Ivory & Co., luxury British made bridal garters by Atelier-Rousseau Bridal & Boudoir and now introducing the brand new British designed mix and match bridesmaid collection, Motee Maids. Even if you have chosen your wedding gown elsewhere, we are very happy to welcome brides who are looking just for wedding accessories! The boutique door is always open and you are assured of a very warm Yorkshire welcome! We have close relationships with some very talented local business women in the bridal industry who we can highly recommend, including talented wedding photographers, a lovely team of bridal hair stylists, make-up artists and amazing wedding cake designers, among a few others! We have worked very closely with all of the local Yorkshire bridal businesses and you are assured of their utmost professionalism and outstanding customer service. Don't hesitate to ask for more details. Award winning Wedding Dress designer Alan Hannah is at the forefront of innovative wedding dress design and all of our wedding gowns are proudly British, made in London. Our designer, Marguerite Hannah is one of the most respected and experienced couturiers working in England today, with over 25 years of experience. Marguerite has been awarded designer of the year on seven occasions and continues to lead and influence modern designer wedding dresses as well as creating two other collections including Mia Mia. We are so confident in our selection of gowns that you are sure to find your perfect wedding gown here with us. Ivory & Co. is a long established and well respected company within the bridal industry. Best known for their award winning bridal accessories, the British based business has flourished to supply brides with the designer dresses of their dreams all over the world. Their signature identity for their wedding gowns is understated elegance - luxury designs in exquisite silk fabrics for the sophisticated bride. Their head designer Sarah is passionate about bridal wear design - “a wedding dress should simply be the most important, most flattering and most emotive garment that a woman ever wears in her life. It should be beautifully shaped to give a flattering silhouette and be created from the finest possible silk fabrics with unique and breathtaking styling." We are so confident in our gorgeous collections that you are sure to find your perfect wedding gown with us. The MiaMia collection is designed by Marguerite Hannah in London, who is also the designer behind the couture Alan Hannah label. As the younger sister, MiaMia is individual and has her own personality, separate from her sibling. MiaMia is strong and forward thinking but takes from the older sisters experience. Marguerite has produced a complete collection of dresses inspired by the early part of the 20th Century. This era was full of change and turbulence and with this came vibrancy and dynamism as people in uncertain times still strove for glamour, fun and success. She created a collection of dresses that are beautifully embellished with exquisite beadwork using sumptuous new fabrics with subtle colour and texture. Shying away from lace she has created a modern vintage collection for brides to wear and enjoy and look back on for ever more. There are timeless pieces and there are fun debutant styles and there has been no expense spared in the sheer quality and cut of this collection. We are so confident that you are sure to find your perfect wedding gown amongst our gorgeous collections here in the boutique. Lyn Ashworth is renowned for her signature style, romantic, flowing organza skirts and perfectly fitted boned bodices, which are somewhat her trademark and key to every collection, alongside this sit's impeccably cut, figure skimming and softer silhouettes. - With understated elegance, balance and sophistication, each design is created using the most luxurious fabrics and exquisite embellishments. Each wedding gown is hand made and crafted from start to finish by designer Sarah Barrett and her highly experienced team of cutters and seamstresses in the Made in England couture house. The boutique offers you an extensive selection of these beautiful gowns and we are confident that you will find your perfect Lyn Ashworth wedding gown here with us. Starting out with Sally as the designer and factory manager and her husband Mike as Sales Director we set up with the assistance of 20 machinists in a small factory in the heart of the Devon countryside. We quickly expanded our brand over the coming years as the designs evolved, whilst keeping our core values central in all areas. Twenty years ago we moved to a larger premises, but we still operate in the Devon countryside and 3 more members of the family have joined the business and continue to drive our legacy forward. The beautiful new Olivia Rose Bridal collection draws on our 35 years of experience in the bridal industry. Designed and handmade in the UK, with our team of British designers going the extra mile to create a selection of gowns worthy of your special day. I am sure you will agree. Motee Maids was launched in 2017 by an ex occasion wear buyer in partnership with a leading bridal manufacturer, to bring a new and exciting bridesmaid concept to independent bridal boutiques. Motee Maids allows brides to have a creative input to ensure each of their maids has a gown perfectly suited to them. Born out of a passion for weddings, colour and hand embellishment, Motee Maids offer timeless and elegant gowns bridal parties will love wearing and creating. Di is an exceedingly passionate and talented shoe artist who has designed footwear alongside industry experts throughout her 25-year career. She has now combined this wealth of experience with her phenomenal eye for design by creating her own range of gorgeous wedding shoes and unique shoe accessories, which marry her fabulous flair for fashion with her passion for designing beautiful, hand-crafted shoes. Harriet Wilde is a British bridal shoe brand, synonymous with unique signature designs, luxurious embellishments, high quality and comfort. Established by Ruth Shaw, the brand was named after her grandmother, and has become the go to bridal brand of royalty and celebrities. Harriet Wilde designer bridal shoes are designed with style and comfort in mind, the brands ready to wear collection comes in a variety of shapes and heel heights. Each pair of shoes is manufactured using only the finest materials and embellished by hand in London. Bijou is excited to be stocking a selection of Harriet Wilde wedding shoes here at our wedding shop in rural West Yorkshire. Richard Designs is a family owned and run British bridal accessory business, founded nearly 30 years ago. In that time they have grown to become the leading designer and manufacturer of bridal accessories in the UK, with stockists worldwide. 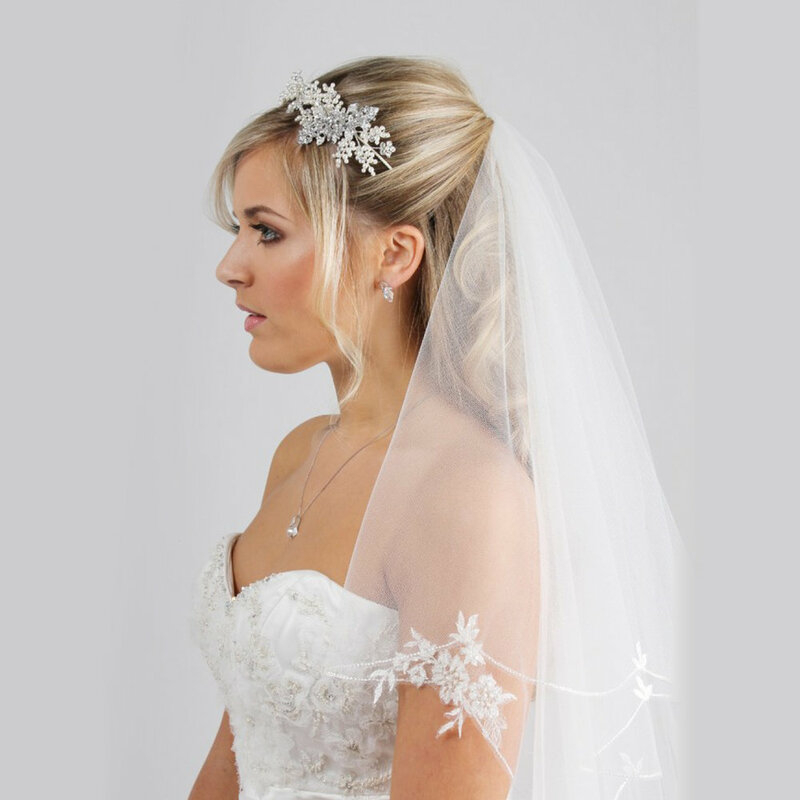 Richard designs offer a wide range of tiaras, veils, and jewellery. We have a selection available for your delectation at Bijou Bridal Boutique here in picturesque West Yorkshire. Each pair of Rainbow Club bridal shoes are handmade using only the best components, from exclusive dyeable satins to Swarovski buckles and embellishments. Rainbow Club also spend time ensuring that their wedding shoes are comfortable, leaving the bride free to concentrate on her special day, or glamorous event. Rainbow Club have been designing, making and colouring handmade satin wedding shoes since 1986 and are now firmly established as the UK’s leading and most inspirational producer. Bijou are pleased to stock Rainbow Club here in our Holmfirth bridal boutique.